I play a game with my friends: Which is a better song, “Maps” by the Yeah Yeah Yeahs, or “Since U Been Gone” by Kelly Clarkson? The question has its roots in a scene in John Seabrook’s book The Song Machine. The producers Dr. Luke and Max Martin are sitting in a room listening to “Maps.” They like the song, sure, but they’re frustrated that the song never comes to a clear, explosive chorus. So they decide to make a song that has the same atmosphere and also the makings of a pop hit. The result was “Since U Been Gone,” which became the most popular song of the first decade of the 2000s. It was the type of insidious song that rockists like to complain about. And, to be sure, “Maps” is all over that song, especially in the guitar solo. This story is echoed in Ezra Koenig’s story about the genesis of the new song “Hold Up” that he produced and wrote with Beyoncé. A bit of “Maps” was stuck in his head, too. Like nearly every track on Beyoncé’s new album, Lemonade, it came to be through the grab-bag pop process. What’s different is that Lemonade resists those explosive choruses that Dr. Luke and Max Martin were after, thus reshaping what’s possible for such a mainstream artist. Is it possible that the most hyped pop performer of our era could be avant-garde? We talk about the avant-garde as though it can only spring from the mind of a lone, starving artist, and we say that the opposite of the craftsman’s approach goes into the creation of a pop album. But Lemonade feels like an avant-garde document. It’s impressionistic, it builds on filmic history, fuses documentary with fiction, and uses polyphonic voices to tell a broad story. In his 2014 book Freedom Time, the Yale English professor Anthony Reed details the long, unsteady history between blackness and ideas of the avant-garde. He contends that, in general, the work of black artists is burdened with the expectation to be literal, political, and representative, whereas white artists have the freedom to break away from such constrictions altogether. Even after Lemonade, Beyoncé’s most experimental project, large audiences immediately searched for statements that the album made about her real life, seeking out living analogues for “Becky with the good hair” among Jay Z’s rumored mistresses. There’s a special anxiety of influence that comes along with being a young creative of color who wants to make strange works of art. There are ways to complicate this narrative, and the history of class analysis in art certainly can help. Beyoncé is certainly not the first person to make art that comments on race and identity in a way that feels expansive and humorous. In his book, Reed identifies Douglas Kearney and Claudia Rankine as two poets whose “graphic images and allusions to mass culture draw attention to the dimensionless moment of expression in a period during which commodified black expression is celebrated even as black lives remain precarious.” That is to say, artists shouldn’t have to compromise on making political commentary in order to make work that expands the idea of what art can be. Lemonade does the work of complicating that narrative, most prominently by recruiting others to contribute to her album. The Somali-British poet Warsan Shire adapted her poetry for Beyoncé to recite in the interstices between songs on Lemonade, and her words import so much of what is cool about contemporary poetry: shifting perspectives, imagistic storytelling, and magical thinking. She puts striking words in Beyoncé’s mouth that might not have heard from the singer otherwise. For example, consider Shire’s commentary on seeking absolution after betrayal, delivered with Beyoncé’s coldest affect: “I plugged my menses with pages from the holy book.” It’s a gross, knotty image—the specialty of a contemporary poet, not a pop star. But Beyoncé’s execution of Shire’s words is crucial. She’s an impeccable actress; like Ingrid Bergman, her face doesn’t give anything away, pushing a viewer to work to read her emotions. Beyoncé’s not in the business of making hits anymore. She seems to be in the business of imagining something new. 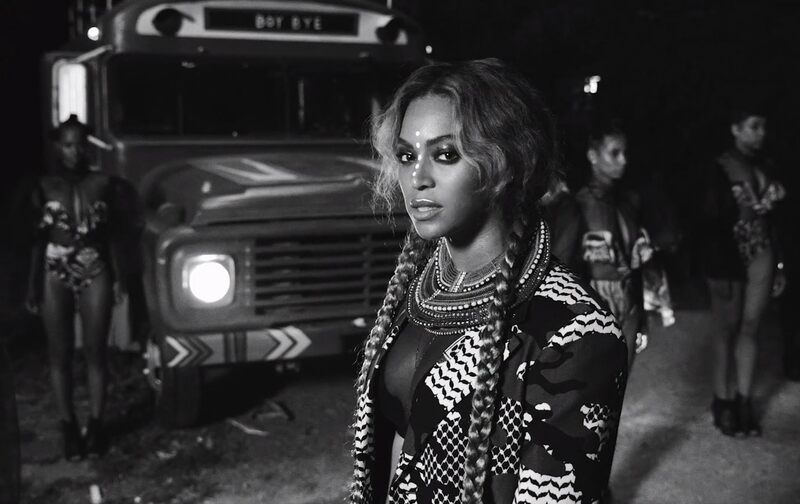 Beyoncé served as the executive producer on Lemonade, so she had power over the curatorial and visionary decisions that make it so distinctive. As an art object, it’s layered in a way that a stack of books is: It’s a coherent whole, but it has seams, sites where creative decisions stand out. From the Isaac Hayes (performing Burt Bacharach’s “Walk On By”) sample on “6 Inch,” a song about a working girl—once you hear it, you can’t unhear it—to the clever quotations of songs like Animal Collective’s “My Girls” and Soulja Boy’s “Turn My Swag On,” the music bears the marks of a bunch of talented people getting together in a room and having a lot of freedom to make something enjoyable. In some ways, this is how almost all pop music is written now: A producer or two will write a track to serve as a song’s general architecture, and send it out to a few writers to give it a melody (or “topline”) and provide hooks. Joshua Tillman, the musician also known as Father John Misty, describes this process when relating how he wound up with a writing credit on “Hold Up”: Beyoncé and Koenig sent him a track, he sent back some melodies, and two years later, they wound up on the song. This type of songwriting began to supplant the approach of the Bacharach era, when music and lyrics were developed relatively separately, and it became especially prominent once more urban-and dance-inspired pop became ubiquitous a decade later. (It’s given an incisive history in Seabrook’s book.) A common complaint is that this approach focuses only on producing hooks and hits, so called earworms, and leads to meaningless songs. In the face of all this, Lemonade is defiant—it’s an album full of hooks without an earworm, without an obvious banger. It conforms to the expectation that lyrics should complement the melody, without sacrificing their ability to telegraph meaning. At its barest, Lemonade is like a competent neo-soul album that’s been fed through a psychedelic rock sampler and given a few additional flourishes. And that’s part of Beyoncé’s genius this time around: Her last album, 2013’s Beyoncé was full of songs intended to be bangers that just didn’t quite fill the dance floor. This one eschews that almost entirely. It’s got a distinctly indie-rock vibe. And it’s the fruition of her interest in the visual-album form, which dates back at least to 2006. Instead of being 14 different exemplars of the 21st-century rap video like we got with Beyoncé, Lemonade is a film. It introduces us to a character, without giving itself over to freezing that character into stasis; it changes her emotional state as often as it does her costume. Of course, though, the notion that the world’s most popular singer just released outsider art is a bit of an oxymoron. But thinking about the way the “middle” of both the music industry and the film industry has disappeared, it seems like only a rich, rich person could afford to take the kind of risks Beyoncé has taken in making Lemonade. And perhaps that’s why she waited until 13 years after her solo debut to make this sort of album. She’s not in the business of making hits anymore—her last super-smash of a single, “Single Ladies (Put A Ring On It),” was released seven years ago. She seems to be in the business of imagining something new or different, and drawing people to those spectacles. Lemonade is working for Tidal, and the Formation World Tour is sure to be a boon for promoter LiveNation. There are the seams again: It’s ironic, or at least unusual, that a document of commoditized black expression could contain a political critique within it. But, in fact, that’s what feels so distinctly sad about our current moment: We look to entertainers to resolve our American angst about society and the economy. No one else seems to be offering anything of use; and yet, counting on the entertainment industry to be our vehicle of social change only lets more people off the hook. About 10 minutes into Lemonade we’re shown a succession of black female faces over a Malcolm X speech about the plight of black women in American society. The faces of those black women make it apparent: How do we go on in a society where pain and iniquity can be aestheticized and explained but never fully absolved? Seeing Beyoncé as a paragon of black femininity has its perks, but her work is asking us to think about the limits of looking into someone else’s face and seeing your own. There’s a simple narrative that we could ascribe to these people: They’ve been abandoned by their country just like Beyoncé’s character has been betrayed by her husband. It’s understandable why so much of the conversation around the album has focused on Beyoncé’s feminism and her performance of strength. But the best thing about Lemonade is how resistant to that literal interpretation it is. Its narrative is fractured; the pleasure of reunion or solution is frustrated. The album ends with a shot of Beyoncé sinking into hurricane waters on a New Orleans police car, in front of a bleak yet cloudless sky. It’s not a story of triumph, but of resilience and work yet to be done.